About 6 months ago, I wrote a package for the R programming language called rNOMADS. It interfaces with the National Oceanic and Atmospheric Association’s Operational Archive and Distribution System (NOMADS), comprising everything from global weather forecast models, to high resolution regional models, to wave and sea ice models. rNOMADS uses R to download requested data from the NOMADS servers using two different methods: direct ascii data retrieval and GRIB file retrieval. GRIB is a binary file format that can’t be read into R directly – it requires external programs that must be installed separately. This post describes how to install rNOMADS with GRIB support, which is available for Linux systems only. Windows and Mac users should use the ascii download routines; I will write a tutorial and post it shortly. rNOMADS allows R users to make some spectacular pictures (see below) but I also hope that it will lead to greater availability of these valuable resources to data analysts all over the world. Already, rNOMADS is being used in an online sailboat racing game and to get data for predicting solar and wind energy output. 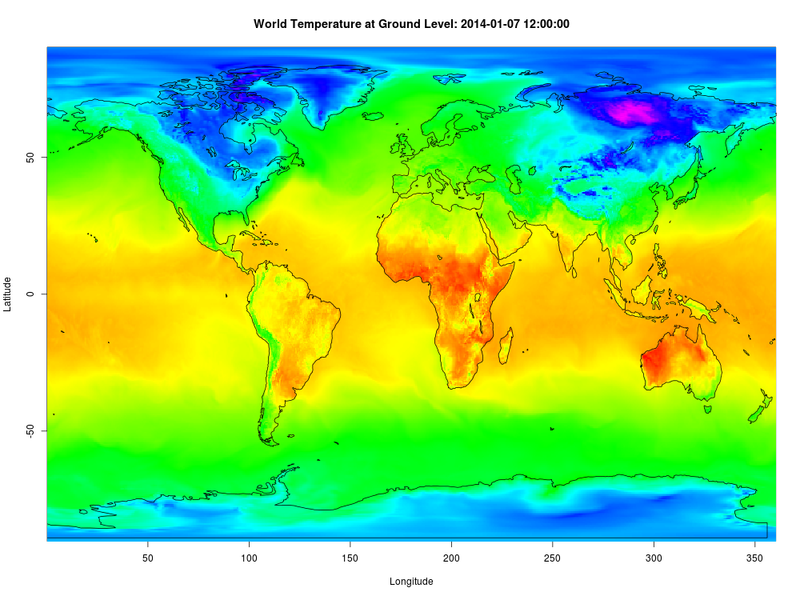 World temperature at 2 m above ground, generated using rNOMADS. The first step is to make sure R is configured correctly. You can skip the reinstallation (step 2) if need be, but I recommend getting r-base-dev anyway for all the libraries it has. Then, I build R from the source. You can skip this method if you’ve already done this. Now we get dependencies for specific packages that rNOMADS requires. Now, we install wgrib2 and wgrib and add them to our path. add “/usr/local/wgrib2” and “/usr/local/wgrib” to the end of the PATH variable, then close /etc/environment and close the superuser terminal. Now we install rNOMADS and another package called GEOmap so that we can build and test the example vignette. The latest R release has been causing issues with Sweave; if you don’t see any figures in your PDF or if the document compilation fails, try running Sweave using the commands described here. This should create a PDF file called “rNOMADS_grib_examples.pdf” with code and images. It should look similar to this one. ← The Glossarch live at #ScienceFail, Morehead Planetarium, Chapel Hill, NC! Enter your email address to follow this blog and receive an email when something big happens! Follow the launch on Twitter!